Mysqldump with GUI and Scheduler - Automatic Backup Scheduler for MySQL. Automatic Backup Scheduler for MySQL > Tutorials > Mysqldump with GUI and Scheduler. Mysqldump is a console application for MySQL database backup. To use the application, you have to learn and enter a lots of SQL commands, and you have to install a full MySQL server on your local computer. 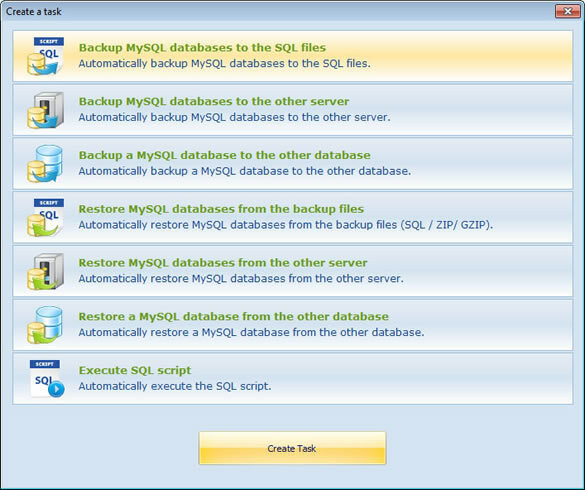 The application can not schedule the backing up and restoring of your MySQL database. 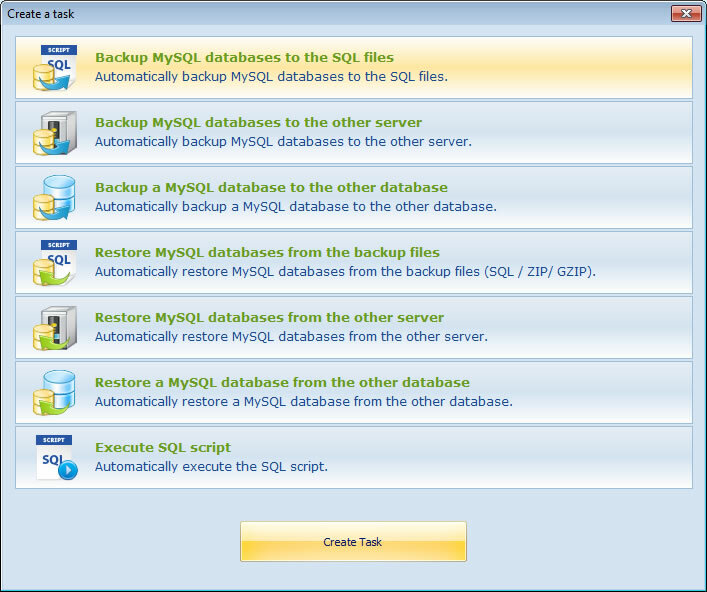 We recommend you to use a MySQL backup GUI software - Automatic Backup Scheduler for MySQL. Automatic Backup Scheduler for MySQL is an easy-to-use and professional automated MySQL backup and recovery software with user friendly GUI. It can be used to back up MySQL database to the SQL files, the other MySQL server or database on schedule, and it supports Full Backup, Incremental Backup and Differential Backup. It also provides command line interface program - MySQL Backup Command Line Program. It works as a stand-alone utility, and does not require any additional software. Let's look at the features of Automatic Backup Scheduler for MySQL and mysqldump.